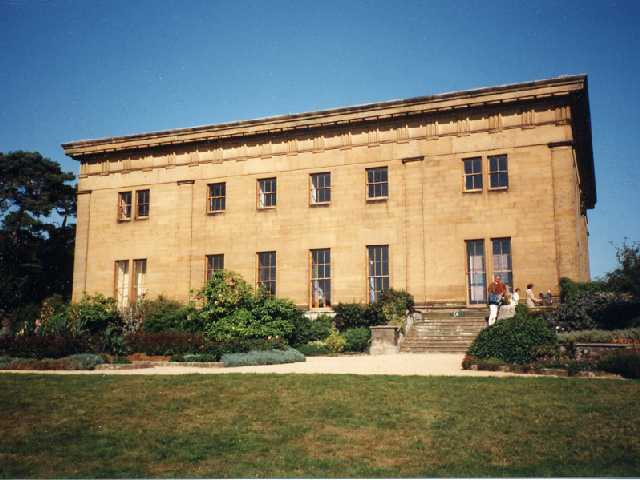 Belsay Hall. Photo by Northumberland County Council. The parish of Belsay contains some of Northumberland's most important monuments, and historic sites still dominate the landscape of the area. Although the medieval and later architecture of the parish is the most visible part of the parish's heritage there are many traces of earlier periods below the soil. The earliest trace of human occupation in the parish belongs to the Mesolithic period, a time before farming had been introduced. A number of worked flints belonging to this period have been found in the area of East Shaftoe Farm. These tools may have been used to hunt animals and birds or harvest wild plants. The first evidence for actual settlement comes from shortly after the Mesolithic in the early Neolithic period. The discovery of an occupation site of this period is very rare in Britain and unique in Northumberland. Some late Mesolithic finds were also made at the same site in Sandyford Quarry field suggesting that people had been living at the site for a long time. Many flint tools of the Neolithic period have also been found at several sites in the parish, including East Shaftoe, Middleton Bank and Shortflatt. In the Bronze Age people began to make objects out of metal, particularly bronze, as well as flint. This can be seen, most spectacularly in Belsay with the discovery of two bronze shields. Such objects are very rare, and they may have been buried for religious purpose, as in this period valuable metal objects were often given to the gods in this way. Other remains of Bronze Age religious practices can be found across the parish. Two standing stones have been found, one on Bygate Hill and one next to a burial cairn at East Shaftoe. The precise purpose of these monuments is not clear, but they are quite rare in Northumberland, and as such are of great importance. Also, a number of Bronze Age burials have been found in the parish. A large barrow is known at Stob Hill, and another grave has been found at Bygate close to the site of a cairn. A number of Bronze Age pottery vessels have also been found: from near Belsay Castle, Black Heddon and West Bitchfield. These may well also have come from burials. Despite all this evidence for how the people of the Bronze Age worshipped and buried each other, no evidence for their houses or villages has been found in the parish. This may be because these settlements were often very slight, and their remains have probably not survived. The situation in the Iron Age is in complete contrast. Although there is little evidence for burial practices from this period in Belsay, there is good evidence for settlements. This evidence is mainly in the form of cropmarks seen on aerial photographs. These have shown the presence of fortified enclosures near Bolam Hall, on Slate Hill and at Huckhoe. These were surrounded by one or more earth banks and ditches, which would have protected the buildings inside. Querns, stones used for grinding corn, have been found at both sites. These show clearly that crops, such as grain, were being grown nearby. Although the parish is not far north of Hadrian's Wall, the northern edge of the Roman Empire for much of their time in Britain, little seems to have changed in the Roman period. The settlement at Huckhoe continued to be used into the Roman period with few changes. The only obvious change in settlements is a move to the use of rectangular rather than oval enclosures. Such sites can be seen at Edgehouse and Low House. However, the parish could not entirely escape the influence of the Roman army. A Roman road ran north through the area and at one point a small fort was built to protect it. It is along this road that the Roman pottery found at Bolam may have arrived. Following the end of Roman rule in Britain in the early fifth century there is very little evidence for any form of occupation until after the Norman Conquest (AD1066). However, we know there must have been some Anglo-Saxon occupation in the area as many of the place-names in the parish are of Old English origin. For example, Belsay means 'the ridge of land belonging to Bel.' In addition the parish Church of St Andrew contains some Anglo-Saxon material, belonging to 10th or 11th century. By the Middle Ages the parish was densely settled. As well as the village of Belsay itself there were a number of other named settlements, many of which must have had their origin in the earlier Anglo-Saxon period. The number of settlements suggests that the area must have been extensively farmed, allowing the land to support so many people. The area suffered from a period of warfare and many raids from Scotland. It was because of this that a number of fortified tower houses were built, including the particularly well-preserved one at Belsay. There was also a growth in the number of religious buildings in the medieval period. As well as the parish church, which was considerably added to at this time, there was also a chapel at Belsay Hall. A hospital, which would have been run by the Church to serve travellers, was also built in the 13th century. The parish continued to be an important agricultural area into the post-medieval period. The wealth from farming must have helped pay for the construction of Belsay Hall, a building of outstanding architectural importance. When it was first constructed it was on the cutting edge of European design and one of the first houses of the Classical revival in the country. It is even more important as it is set in a nationally renowned landscape park. This garden links Belsay Hall with the Belsay Tower house, which was retained as an important feature in the park. The creation of this park has also had wider consequences on the landscape, as the old village of Belsay was demolished to clear the way for the gardens. The new estate village was rebuilt at some distance from the main house. The beautification of the estate in the 18th century even went as far as building a farm in the fashionable Gothick style. Belsay Hall still keeps its central role in the parish. The hall, the house and the 30-acre garden are now owned by English Heritage and are open to the public. English Heritage has made great efforts to return Belsay's gardens, which suffered from neglect after World War II, to their former state, to complement the great house.